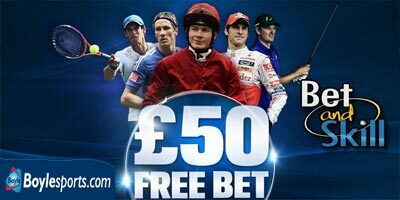 Open an account, place your first bet of £/€5 or more and if it loses, Boylesports will match it with a free bet (Max £/€25). Place 5 more bets (real money) and get a free bet for your average stake (Max £/€25). If you win your first bet, you are still eligible for a free bet based on the average stake of your next 5 bets as above. Find below more details. This offer is available to UK and Ireland customers, it only takes a couple of minutes to complete the registration form and make a deposit. Great range of markets for Premiership football with over 40 priced up for every game pre match and often almost as many in running! Good range of ante post horse racing odds always available. Best price guaranteed on the horses. Take an early price and if the starting price is better they will pay that! Daily cashback specials such as refunds on seconds in horse racing and money back on certain football markets when a named player scores last. Place a bet of €/£5 or more and if it loses, Boylesports will match it with a free bet up to £/€25. Free bets are applied on a next day basis. Qualifying bets placed at 2.0 / Evs or greater. This also applies for combined odds for multiples. Free bets do not qualify for special offers, such as Cash Back Specials, Best Priced Guaranteed and Extra Places etc. "New Boylesports betting bonus up to £/€50 (no bonus code needed)"